The Race of Champions this year has a slightly underwhelming entry list this year, with names like Loeb, Hamilton, Ogier and Marquez not appearing on the list, and with a few too many test drivers to really live up to its name. Should you watch it anyway? The Race of Champions may be a frivolous exhibition race that doesn't really count for anything anywhere else, but it's still worth a watch. 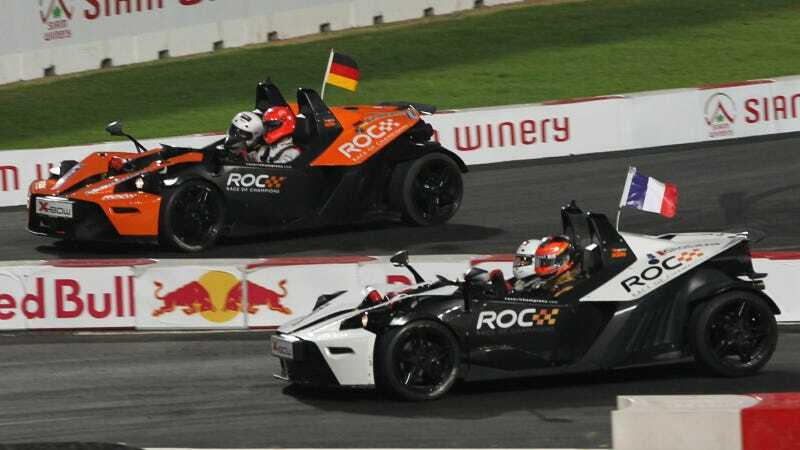 The Race of Champions features a Nations Cup that decides a race between the different countries' teams plus the Race of Champions itself that determines the fastest driver of the lot. Competitors are put in identical cars from different forms of motorsport and duke it out on a level playing field. Here's some of the machinery that's showing up this year. Stadium Super Trucks make their ROC debut, which should be utterly fantastic. We love those, and they're certainly true to ROC's rally roots. The Race of Champions was originally a race among the champions of rally before it expanded to famous drivers in other forms of motorsport. So, the more off-roaders involved, the better. After taking a year off due to unrest in Bangkok, the race is back on for 2014. This time, they're at the Bushy Park circuit in the tropical paradise of Barbados. Wait. Wait. Wait. You have a country known for pumping out series-dominating rally Sébastiens and you give us two random Lotus F1 drivers, one of whom is just a test driver? To be fair, Ocon is the reigning Formula 3 Euro Series champion for 2014, and Grosjean has multiple feeder series championships to his name, including Auto GP, French Formula Renault, GP2 and the Formula 3 Euro Series. But they're just that: Formula One's feeder series. Not the main event. Grosjean is fun to watch and would certainly be more of a contender in F1 if he was in a better car, but he can't get it done in the Lotus. You know who'd fit in better at the Race of Champions? Actual F1 world champion Jenson Button. Yeah, I went there. Whatcha gonna do, Grosjean, wave a white flag at me? Grosjean won the Race of Champions in 2012, however, so he's somehow the reigning Champion of Champions, and I guess that's okay that he's here. That being said, this is also the country of Audi Sport Team Joest World Endurance Championship winners Benoît Treluyer and Loïc Duval, too. Shoot, the Volkswagen Group (and Audi in particular) gave ROC the use of several cars for the weekend, including a Quattro S1. Couldn't they have at least loaned out one of their LMP1 drivers? Team France is a bit of a head-scratcher. This one makes a bit more sense. Tom Kristensen is Mr. Le Mans from his nine wins there. Petter Solberg is the reigning 2014 FIA World Rallycross champ and also won the World Rally Championship in 2003. This is a neat mix of two completely different disciplines in motorsport and should be a fun team to watch. Also, they're two dudes known for actually winning stuff at the top of their game. That, too. So, we have a Team Americas and a Team USA, both of which have Americans on them. It could be argued that Robby Gordon IS part of the Baja, so let's roll with it anyway. Gordon's won the Baja 1000 three times, and López is a reigning FIA World Touring Car Champion for 2014. Again, a nice mix of actual champions. Ocon perhaps would have been a better fit for this team, and I like that these guys are here. Palmer is the reigning GP2 Series champion who most recently made headlines for tellin' it like it is in regards to the sorry state of Formula One's pay drivers. "It is disheartening to see drivers I have beaten on the track so easily get a seat in Formula One," Palmer said in Autoweek. "That's the reality of Formula One at the moment, but it sends the wrong message. It creates the impression that F1 doesn't need the best drivers." Palmer's struggling to fund a possible test role at Force India, while dude-he-beat Felipe Nasr walked right into a $eat at $auber. Runner-up for the GP2 title Stoffel Vandoorne is also just a test driver next year for McLaren. Hey, someone's gotta point it out. ROC teammate Pascal Wehrlein is the youngest ever winner of a Deutsche Tourenwagen Masters race and has been testing for the Mercedes F1 team. He won ADAC Formel Masters in 2011. Not as strong a contender as Palmer, but he should be fun to watch given his mixed experience in both formula cars and tin-tops. Finally, a wild two-wheeler appears. Mick Doohan is a five-time MotoGP world champion and exactly the kind of dude people love to see at these gimmicky exhibition races. Jamie Whincup is a six-time V8 Supercar champion, including for 2014. This is how you put together a team for the Race of Champions. This right here. Go Team 'Straya. Hoo boy. I've defended Susie Wolff in the past, as I think her making it up to a test role at Williams is pretty neat-o. But she has zero wins to her name. Nada. Goose egg. None. Zip. WHY IS SHE AT THE RACE OF CHAMPIONS?! If there's a theme to my "meh" when it comes to this year's ROC line-up, it's that being a decent test driver does not make a driver a champion. David Coulthard, too, is another personality I like, but like Grosjean and Ocon, his actual championships have been in feeder series like the Masters of Formula Three and Formula Ford 1600. He's got thirteen wins to his name in F1 and finished second in the F1 World Driver's Championship in 2001, so whatever. Given how tough it is just to be a front-runner in F1, I'd say he deserves to be here. It's impossible not to like David Coulthard in a race car. Team Scotland is Team Famous Likable People. The Race of Champions likes to toss a bone to the locals, so Team Barbados is here. They're not all that internationally known, but they should be fun to watch. Skeete won the Barbados Rally Club Class M5 Sprint Championship in 2008 and three Barbados Karting Class Championships. Watson is the reigning Barbados Rally Club champion as well as Rookie of the Year for that series. Also of note is the ROC Caribbean, which pits the drivers from Team Barbados against teams from Jamaica, Guyana and Trinidad & Tobago. The fastest driver from Team Barbados in the ROC Caribbean will advance to the head-to-head Race of Champions races on Sunday, and the fastest other Caribbean driver will advance with them. USA! USA! USA! We have a solid team behind us as well, with 2012 IndyCar champion and father of the cutest kid in motorsports Ryan Hunter-Reay and 2004 NASCAR Sprint Cup champion Kurt Busch. Both two uniquely American motorsports are represented here, which is pretty cool. The Race of Champions may be light on the "champion" part this year, but it will still be a blast to see competitors try out cars they wouldn't normally drive, as always. So, yeah, watch it anyway. Whether you're rooting for teams of top-level winners who seem to belong there or rooting for an underdog upset from the ones who are here, but you're not sure why, The Race of Champions should be a fun time. NBCSN will be showing highlights on Thursday, December 18 at 7:00 p.m. EST, but if you can't wait until then, the entire race will be live-streamed on the Race of Champions website. A full schedule for the weekend is here if you'd like to tune in. *Welllllllll...if you want to get into specifics, there's the Gulf 12 Hours this weekend, too, plus Formula E. Formula E is on TV and the Gulf 12 Hours has a live stream. So, actually, there are still a couple other things to watch even though it's generally accepted that the offseason is upon us.